Wendy Ives grew up in her mother’s art studio, learning the 6 elements of design. She would come home from school, (beginning in nursery school at the age of 3 and continuing up through adulthood) and sit in the strategically placed chair, to look at her mother’s day’s work and discuss art. Most children would play, eat cookies and/ or watch television before homework. She was learning to critique her mother’s paintings, learn about her studies with modern painting masters, eat dinner, and then have a mechanical drawing lesson from her father, before a little tv and then bed. Visiting art museums in NYC was a regular event, with her mother as docent, who knows all the details of each work of art on display. Each piece of Wendy’s Felt Art starts out with white unspun fibers, known as roving. As a fiber artist using high quality, organic wool from small family farms, sustainable farming is an important in Wendy’s process. She dyes using non-toxic traditional plant and insect dyes. These are dyes she grows, makes from compost, and responsibly sources. Occasionally she incorporates other fibers for depth and texture. All the shaping and molding of the wool is done by her hand, using a wet felt method, with organic soap made by the soap company, IthacaSoap.com, that she founded with her husband Andy in 1999. Andy has been the master soap maker since 2004. Each individual piece is designed and laid out freehand and then the entire piece is wet felted. There is no pre made, pre dyed, or pre felted wool, in her pieces. No sewing, knitting, gluing or weaving techniques are used . The thin durable felt has wonderful drape and is a technique she has been perfecting since 2007. Every piece can be washed either by hand in cold water with gentle soap and some white vinegar, or in a front loader washing machine on a gentle cold cycle. 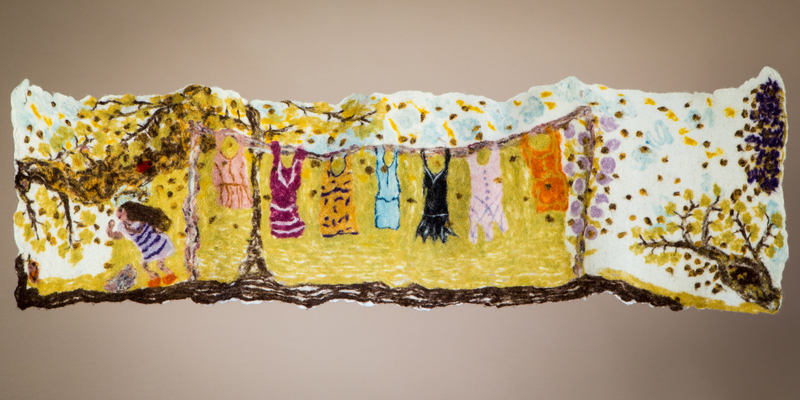 “Each felt painting depicts how I see the world and my personal experiences. They tell my story”, says Wendy. A hands on artistic approach and materials are combined with organically farmed products, delivering a message of, “Sustainable methods produce superior products”. Not only does each piece have a message, but the materials and methods used have an underlying message that goes along with the piece’s subject matter. Fiber is notoriously produced in colonial situations by underpaid employees, using unsustainable practices, using factory farmed methods. Throughout her life, Wendy has always created art and craft in various mediums: jewelry, sculptural evening bags, knitting, and sewing, then entering art shows and exhibits, where she won awards and cash prizes.